I was recently invited by a friend of mine to a lecture at the National Physics Laboratory (NPL), given by Dr Mike Tarbutt of Imperial College London, on the process of cooling molecules close to absolute zero. Being interested in all things science-y I went along. It proved to be fascinating. The lecture itself focused on cooling of Calcium Fluoride (CaF) and Ytterbium Fluoride (YbF) molecules and capturing them in a Magneto Optical Trap (MOT). I learned far more than I could put down here, so I will focus in this post on the process of cooling CaF close to absolute zero, around 50μK to be precise. 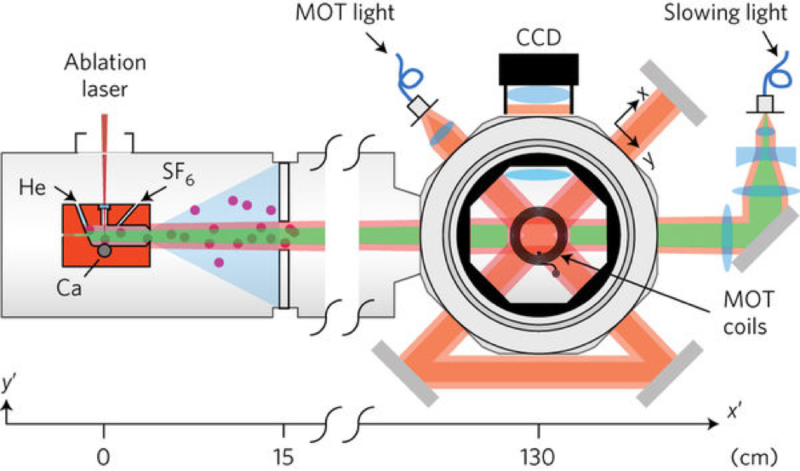 In order to capture the CaF molecules in the MOT, they must first go through a series of slowing and cooling stages. Figure 1 shows a diagram of the whole setup. The first stage is to produce a pulse of CaF molecules directed towards the MOT. In order to achieve this a source of calcium is reacted with Sulphur Hexafluoride (SF6) using the ablation laser (Figure 1, left hand side). Helium (He) is then used in a continuous flow in order to make the CaF molecules pulse towards the MOT. This helium gas is also cooled to a very low temperature of 4K to help reduce the initial temperature of the CaF molecules. Once the CaF molecules have started flowing towards the MOT they then need to be cooled and slowed enough in order to be caught by it. The molecules start at speeds of ~150ms-1 and are slowed to ~10ms-1. To achieve this laser cooling is used, also known as Doppler cooling because of its use of the Doppler effect to ensure that molecules coming towards the laser are hit at the right frequency to resonate with the atom. At this correct frequency, the molecule will absorb the photon of light and emit an identical photon with the same momentum as the photon it absorbs. Therefore, if the direction of the photon it emits is in the opposite direction to the movement of the molecule, it will cause it to slow down. The laser operates at a slightly lower frequency and the Doppler effect causes this frequency to increase as the molecule moves towards the source, eventually causing a photon to be absorbed and emitted. The Doppler effect also ensures that the CaF molecules are hit at the right frequency so that they are slowed down and not sped up by the laser. It was found however that just by reducing the laser’s frequency by a constant amount wasn’t sufficient at slowing the molecules down enough to capture them in the MOT. Another addition had to be made to do what is referred to as “frequency chirping” whereby the laser’s frequency is changed dynamically to ensure that it resonates with the molecules for as long as possible as they are travelling towards the MOT. This allowed the molecules to be slowed enough to be captured by the MOT. Once the molecules are trapped in the MOT they are concentrated at a molecule density of roughly 1.6 x 105cm-3. The molecules are then transferred into a three-dimensional blue-detuned optical molasses where sub-Doppler cooling is used very effectively to reduce the temperatures even further. This is not just theoretical science, these ultra cold molecules have multiple applications. They can be used in atomic clocks, to measure the electric dipole moment (EDM) of electrons, loaded into microscopic optical tweezer traps and formed into regular arrays for quantum simulation. They could even be loaded into chip-based electric traps and coupled to transmission line resonators in order to create a quantum processor. There are many more possibilities and this is an exciting field of science right now. If I get the chance, I’m definitely going back for more.